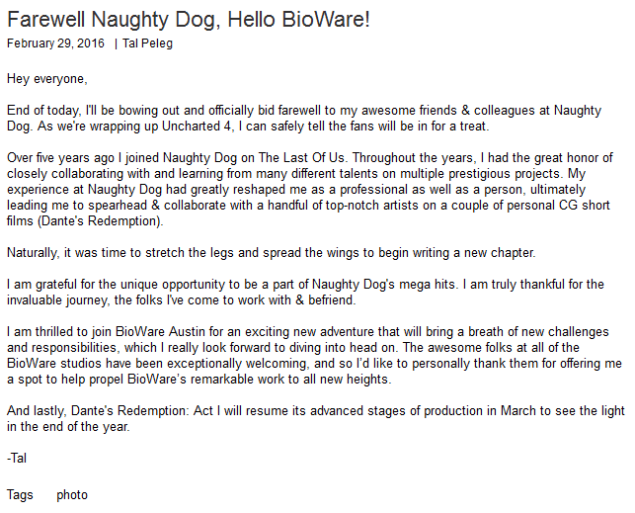 Uncharted 4 & The Last of Us senior cinematics animator, Tal Peleg, will be stretching “the legs” to join Mass Effect Andromeda developer, Bioware Austin. Peleg announced his career switch through Twitter, and wrote a farewell letter on his personal blog. Thanks for everything ND! U4 is superb; fans will be thrilled. Hello @bioware! The cinematics animator writes that Naughty Dog is wrapping up Uncharted 4, and that fans “will be in for a treat”. 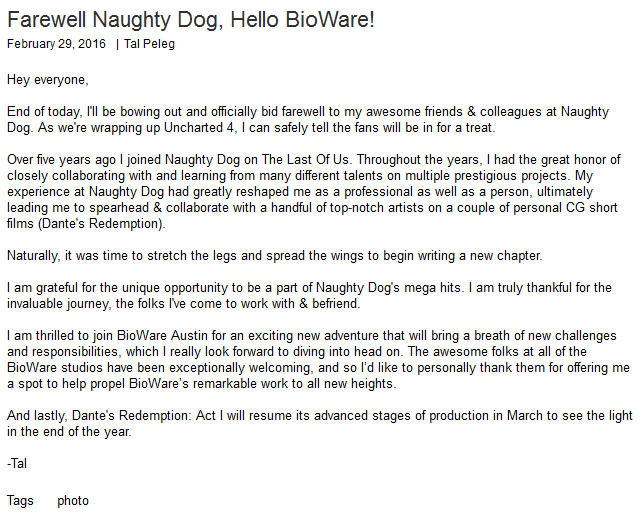 “End of today, I’ll be bowing out and officially bid farewell to my awesome friends & colleagues at Naughty Dog. 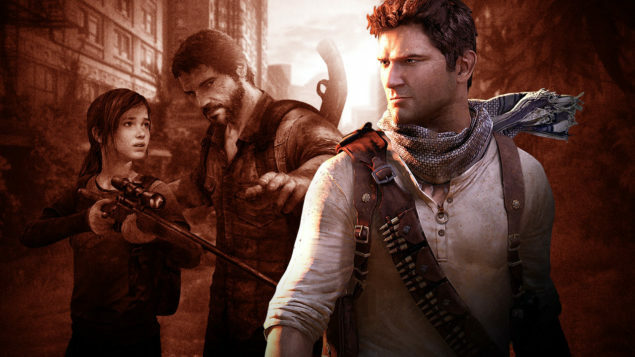 As we’re wrapping up Uncharted 4, I can safely tell the fans will be in for a treat”, Peleg wrote. “I am grateful for the unique opportunity to be a part of Naughty Dog’s mega hits. I am truly thankful for the invaluable journey, the folks I’ve come to work with & befriend”, he added. Furthermore, Peleg expresses to be excited to join Bioware Austin “for an exciting new adventure that will bring a breath of new challenges and responsibilities”. “I am thrilled to join BioWare Austin for an exciting new adventure that will bring a breath of new challenges and responsibilities, which I really look forward to diving into head on. 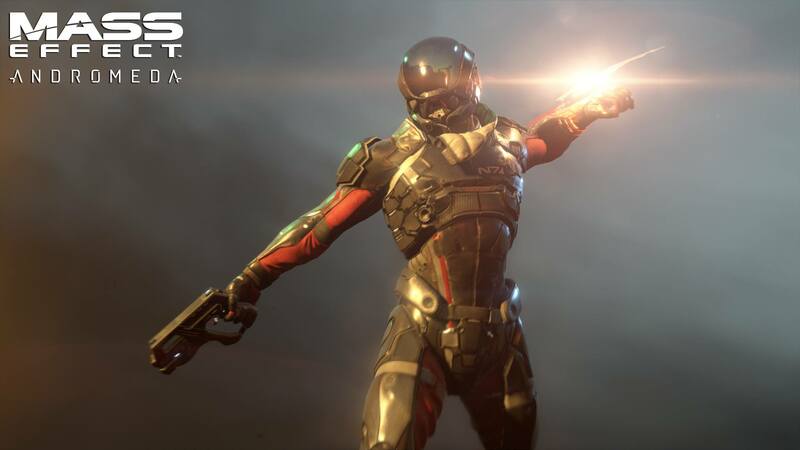 The awesome folks at all of the BioWare studios have been exceptionally welcoming, and so I’d like to personally thank them for offering me a spot to help propel BioWare’s remarkable work to all new heights”, expressed Peleg in his farewell letter. Peleg joined Naughty Dog back in 2011, and worked on animations for ‘The Last of Us’ and ‘Uncharted 4’. Prior to his position at Naughty Dog, he fulfilled a position as senior animator at Electronic Arts. He’s also director at TP Artwork at which he directs the art and animation for Dante’s Redemption – a fan-fiction CG short in a trailer like fashion, based on EA’s “Dante’s Inferno” game. As said, Peleg will now be working at Bioware’s Austin studio on the upcoming Mass Effect Andromeda en other projects.